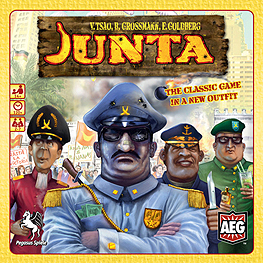 JUNTA is a game of power, intrigue, money and revolution in a fictional banana republic. It is everything but nice: The players lie, betray each other, embezzle, and assassinate the members of the other families to transfer millions of Pesos of foreign aid money to their bank accounts - which are conveniently located in Switzerland. POWER! Do you have enough influence and Pesos to become the new President of the Republica de las Bananas? INTRIGUE! Pay a little money for an assassination to gain a lot more - you need only to guess correctly where the other members of the government are hidden! REVOLUTION! Your assassins may not have been successful, but a group of misguided students in front of the Presidential Palace convinced you that the current regime is unbearable. Get ready to start a Coup and free the Republica de las Bananas of its corrupt leaders. Will the rebels choose you as their next President, or will you be sent to the firing squad at dawn?